The gold vaults of the French central bank, Banque de France, are located in the basements of the bank’s headquarters in Paris, France. The Banque de France headquarters building is on a site in the 1st arrondissement of central Paris, near the Musée du Louvre, and bordered by the streets, Rue de Colonel Driant, Rue Croix de Petit Champs, Rue de la Vrillière, and Rue de Valois. The main pedestrian entrance to the Bank is on Rue de Colonel Driant. The main secure delivery entrance to the Bank is through a high security gate on Rue de Valois. 6. How much gold is stored at the Banque de France in Paris? The Banque de France is the national bank of France, and is a member of the Eurosystem and a shareholder in the European Central Bank. France holds 2,435.4 tonnes of gold in its official reserves, making it the world’s 5th largest official sector gold holder, after the US, Germany, the IMF, and Italy, and ahead of China’s official reported sovereign gold holdings. Italy and France hold nearly equivalent amounts of gold, with Italy claiming to hold 2,451.8 tonnes in its official reserves. The Banque de France’s current gold vaults were constructed underneath the Banque de France’s Paris headquarters building between May 1924 and November 1927, hollowed out 20 metres deep in a 1.7 hectare area site. The vault construction involved 1,200 workers and used 10,000 tons of steel and 20,000 tons of cement. The Bank’s gold vaults are located in a set of chambers known as “La Souterraine” in French, and are located in the 8th lower basement, 28 metres below ground level, in an 11,000 square metre space that has 658 supporting columns and a tiled floor. The vaults are staffed by Banque de France personnel, and only 5 Bank officers have permanent access to La Souterraine. Accessing the vault level consists of a series of processes. Firstly, an elevator journey is required down to the 4th basement level. At this point there is an antechamber, with a 7 tonne armoured door that leads to a small corridor with rails in the floor. When the access passage is closed, a 17 tonne, 2 metre wide steel block moves on these rails via a 35 tonne rotating turret, blocking the entrance to the passage. After this access passage, there is then a 2nd elevator down to the 8th basement level, and another security door with another block on rails, before reaching the actual gold vault area. The vault area consists of aisles within the halls, and there are numerous security doors between some of the columns in these halls, all opened by different sets of keys. In La Souterraine, the gold bars are packed in steel cabinets, each with 4 shelves. Each shelf holds 200 bars (2.5 tonnes), stacked 10 high and 2 deep. Therefore there are 800 bars in each cabinet, (i.e 10 tonnes). The cabinets have wire grille doors, also opened with individual keys. Some gold has on occasion been stored in a display pattern, either in a wall at the end of an aisle, or else, in the case of US Assay office brick bars, in a pyramid pattern . An interesting 3:30 minute video from 2011 features a visit to the Paris gold vaults by a French news team, and visually shows the journey to the vaults and the manner in which the gold is shelved in ‘La Souterraine’..
French photographer Arnaud Frich was commissioned by the Banque de France to create a virtual tour of La Souterraine. Some still photo shots from this project can be seen on Frich’s website, including the massive armoured doors and the passage with rails. How much gold is stored at the Banque de France in Paris? France’s current 2435.4 tonnes of gold reserves consists of 100 tonnes of gold coins and 2335 tonnes of gold bars. The gold stored in the Paris vaults is in the form London Good Delivery gold bars, or equivalent, each weighing approximately 12.5 kilograms. 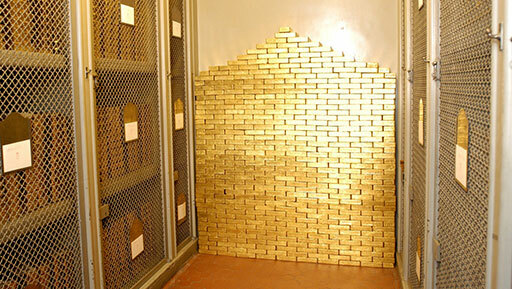 There is also a quantity of 1kg gold bars stored in the Paris vaults. France sold 516 tonnes of its gold reserves over a 4 year period between September 2004 and September 2009, raising €7.8 billion. Similar to Germany and Italy, the majority of France’s gold reserves were accumulated in the 1950s and 1960s, particularly, in France’s case, over the period 1953 to 1968, when the French gold reserves rose from 548 tonnes to 4,651 tonnes. A notable French sale of 1,538 tonnes of gold took place between June 1968 and June 1969. Historically, all of France’s gold is said to have been stored at the Banque de France since the late 1960s, after France brought all its gold back from abroad, a lot of which was shipped back from New York. A Banque de France presentation at the London Bullion Market Association (LBMA) annual conference in Rome in September 2013 stated that at that time (in 2013), 91% of the Bank’s gold was located in Paris and 9% was located abroad. While the ‘abroad’ location was not specified, it most likely refers to either London, the centre of the gold lending market, or else the Federal Reserve Bank of New York, where a holding of French gold could have arisen historically due to gold location swaps. With 91% of its gold in Paris, this would put the Banque de France’s own gold holdings in La Souterraine at 2,216 tonnes. Given that the 100 tonnes of the Banque de France’s gold coins is most certainly stored in Paris, this would mean that 2,116 tonnes of gold bars are in the Paris vaults, which would be in the region of 169,000 – 170,000 large bars, which would fill more than 200 cabinets in the vaults. The Banque de France also stores gold in Paris on a custodian basis on behalf of other central banks. The most high profile of these customers is the Deutsche Bundesbank. While the Bundesbank’s repatriation of gold from the Federal Reserve Bank of New York gets the most media attention, its important to remember that the Bundesbank also stores gold at the Banque de France vaults in Paris. Since it began its repatriation program back to Frankfurt in 2013, the Bundesbank has transferred 177.3 tonnes of gold from Paris and still plans to transfer back another 196.4 tonnes by 2020, making a total transfer of 373.7 tonnes, which was the Bundesbank’s total gold holding in Paris. In 2013, 31.6 tonnes of the Bundesbank’s gold was transferred from Paris to Frankfurt, in 2014, 35.2 tonnes was returned, and in 2015, 110.5 tonnes left Paris for Frankfurt. As to why the Paris to Frankfurt repatriation of 373.7 tonnes of gold could not all take place in one year, the Bundesbank has failed to answer this simple question, and it raises the probability that the Bundesbank’s gold in Paris is either not all there at any given time, or else its on lease or otherwise encumbered. In summary, there are still approximately 200 tonnes of Bundesbank gold bars officially still in Paris, which would require 20 entire cabinets in the La Souterraine vault area. The Banque de France gold vaults in Paris are also one of the four ‘designated depositories’ of the International Monetary Fund (IMF), meaning that the IMF stores some of its gold reserves at the Banque de France vaults in Paris. In February 1976, the IMF stated that it held 12.5 million ounces (289 tonnes) of its gold in the Banque de France in Paris. Between mid-1976 and mid-1980, the IMF sold 25 million ounces of gold to the commercial sector via 45 auctions. Four of these auctions sold gold a total of 1,963,000 ozs (61 tonnes) that was delivered in Paris, i.e. from the IMF’s Paris stocks (6 July 1977 – 524,800 ozs, 1 February 1978 – 524,800 ozs, 6 December 1978 – 470,000 ozs, 5 September 1979 – 444,000 ozs). Following the auctions, this would leave 328 tonnes belonging to the IMF in Paris as of mid-1980. However, the IMF also engaged in gold ‘Restitutions’ in the late 1970s (selling/distributing back gold to member countries), and it sold another 25 million ozs of gold via these ‘Restitutions’. In the distributions, each country could specify the IMF depository that it wanted its share of the restituted gold to be issued at, (i.e. New York, London, Paris or Nagpur in India). Only about 15-20 countries opted to receive there gold in Paris. These were mostly countries with an historical connection to France, and importantly, countries with a gold account at the Banque de France. These countries included Libya, Iran, Iraq, Morocco, and states in French West Africa such as Benin, Guinea, Ivory Coast, Niger etc. Its not clear exactly how much gold was restituted from the IMF’s holdings in Paris since the process involved indirect distributions via creditor countries, but given that the countries receiving gold in Paris tended to be ‘smaller’ IMF members, the amount was probably less than 10% of the total, meaning that it could have been in the region of 30-70 tonnes. This would still leave between 260 – 300 tonnes of IMF gold in Paris from 1980 onward, a holding which should have remained static up to the present day. This would mean there are another 26 – 30 cabinets of gold belonging to the IMF in the Paris gold vaults. This quote by Gautier would also suggest that the Banque de France has a number of other central bank customers apart from the Bundesbank and the IMF. The Banque de France gold vaults are not just for long-term storage. The vaults are working vaults, meaning, that physical gold is going in and out. This is not just activity on behalf of the Bundesbank. The Banque de France’s gold is also mobilised via use in gold deposits and gold swaps. This reference to the Banque de France acting as an interface to the BIS and commercial banks in Europe may be referring to the Banque de France being a party to the 2010 BIS gold swaps which involved 10 commercial banks including BNP Paribas, Societe Generale and HSBC. He points to other bars he considers better-looking. They have gently tapered sides or tops rounded like bread loaves. Each is worth around $500,000. France is slowly selling off a portion of its trove, he explains, but buyers don’t want the beat-up American gold. In a nearby room pallets of it are being packed up and shipped to an undisclosed location, where the bars will be melted down and recast in prettier forms.. Therefore, gold bars are being shipped out of the Paris vaults to gold refineries, so as to be upgraded into modern Good Delivery bars. In a subsequent presentation to the LBMA annual conference in November 2014 in Lima, titled “Managing Gold as a Reserve Asset”, Alexandre Gautier, who is also involved in managing of the Bank’s foreign exchange reserve portfolio (including gold), focused on the active management of the gold portfolio, and highlighted the Bank’s use of gold deposits and gold swaps.